This Christmas season, Warner Brothers Studio Tour Hollywood are pulling on our heart-strings with the unveiling of their newest show-stopping exhibit for Aussie travellers: Get Lost in Love. Crazy Rich Asians – Enter the exquisite life of Singapore’s most elite, with authentic costumes and props from this winter’s breakout hit, Crazy Rich Asians. 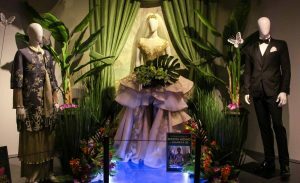 The newest display features eight flawless costumes from the film’s most memorable scenes. See these amazing gowns and fall in love all over again with the dreamy Singapore wedding scene. A Star is Born – Get an intimate look at the authentic props and costumes worn by Bradley Cooper and Lady Gaga in their electrifying on-screen performance in A Star Is Born. See the beauty and heartbreak brought to life with the original costumes from The Shrine performance, handwritten lyrics, a custom-made guitar, and other memorable props.